What happens when you step on one of the great Lego pieces of life? When you get blind-sided? 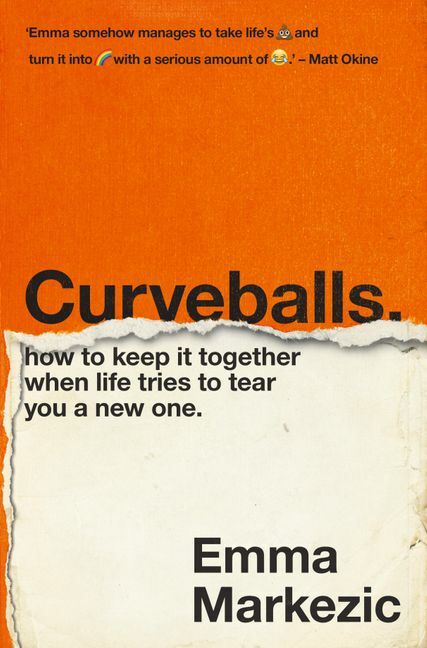 Thrown a curveball? When you get divorced? Or someone dies? You're going to need something more than the diarrhoea-like progression of motivational quotes we get fed on Instagram - you're going to need real-world ways to deal with a big, fat let-down. Because one will come for you, eventually. And when one came for comedian and journalist Emma Markezic in the form of a nasty cancer, despite the fact she found herself bald, broke and living alone, she felt more alive than ever. So she wanted to know why... Why does trauma affect us in such different ways? Why are some people more resilient than others? Why was she handling cancer better than other people handle a paper cut and, more importantly, was it a skill she could teach? When she wrote an article about how learning she might die made her the happiest she'd ever been, it became a media sensation and she knew she was onto something. With dozens of expert brain morsels and more than a little humour, Curveballs is a memoir-meets-self-help manual for how to keep it together when life tries to tear you a new one. Because you'll want to be more resilient than a tardigrade in outer space when it does∗. ∗Microscopic eight-legged animals that can withstand 1000 times more radiation than humans, live for 100 years without water and literally just hang out in space like freeloaders at a Vegas buffet. See... you learned something already!